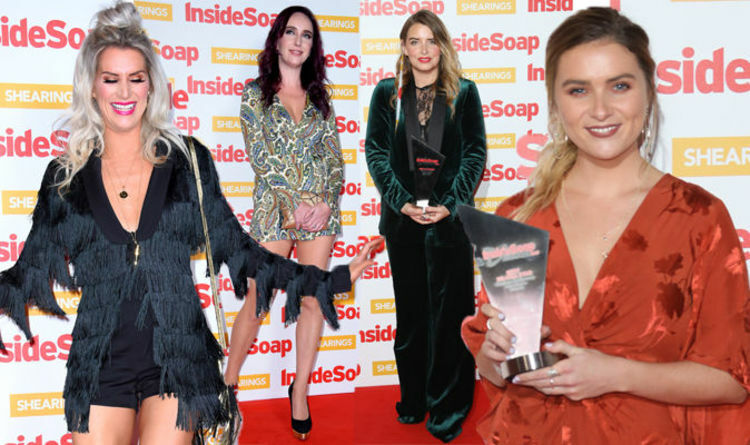 Inside Soap Awards 2018 took place tonight in central London. The awards take place every year, and celebrate the achievements of the British soap and television industry. Famous faces who won on the night included Emmerdale’s Emma Atkins, Danny Miller of Eastenders and Hollyoaks’ Jennifer Metcalfe. Most of the attendees and nominees dressed to impress, a few didn’t hit the mark. Soap royalty and television presenter Kate Oakes wore a daringly short, brightly coloured and busy mini dress, despite the cold weather. Also going very short, Sarah Jayne Dunn of Hollyoaks wore an unusual black playsuit with lots of tassel detail hanging from it. In a sharp contrast, Casualty’s Chelsea Halfpenny wore a loose-fitting burnt orange dress paired with black gladiator heels – with the burnt orange not sitting well with her pale complexion. Award-winner Emma Atkins didn’t quite impress in the sartorial stakes, wearing a baggy green velvet jumpsuit. The legs trailed on the floor and a glimpse of black, sheer lace was visible underneath the jacket. See below for the worst-dressed stars of the Inside Soap Awards 2018.